As long as I live, I will never forget the glow of light dancing on the snow outside the front door of Jim’s house. 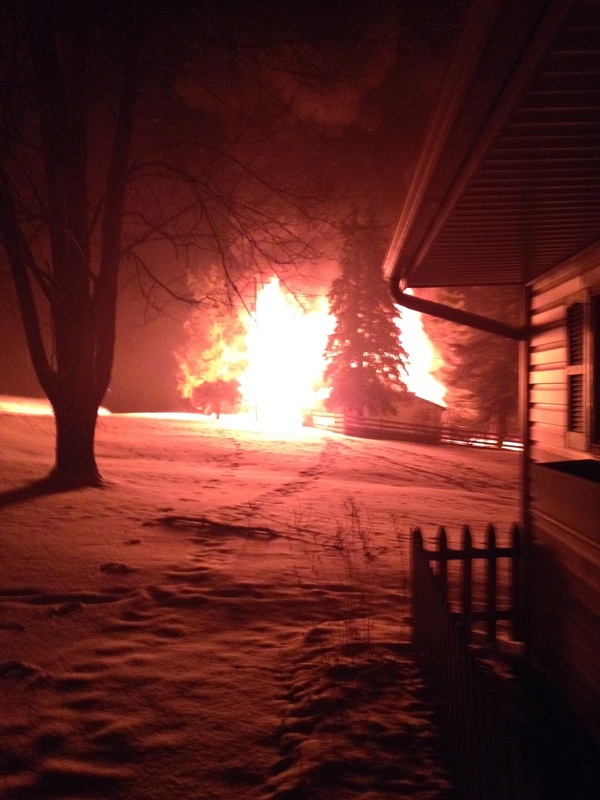 I threw open the door, looked to my right, and saw his barn on fire, with flames shooting 40 feet in the air. 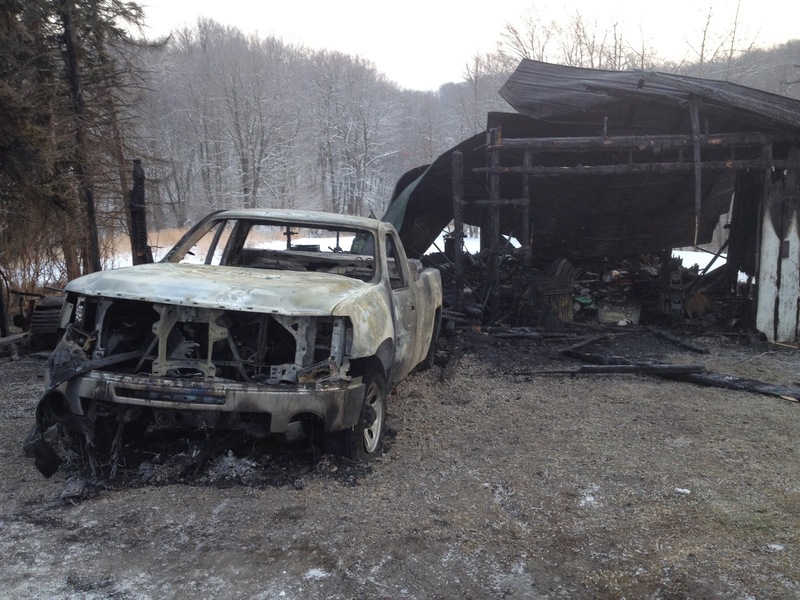 What was burning was more than a wooden structure, tools, and his pickup. On fire was the labor and the love that built it. On fire was the bow tie given to Jim by his mother when he was a young boy. On fire was his favorite dog’s ashes. On fire was the Harley that took Jim and I on many adventures and instilled in me a confidence I’ve never had. On fire was his grandmother’s dining table and chairs, and a dresser his cousin inherited from her mother, who passed away last year. (Jim was refinishing it for her.) On fire was his grandfather’s .22 pistol and the BB gun Jim and his nephews use to shoot targets when they come to visit. On fire were my brother’s snow shoes he bought in 1970, the ones he said gave him a sense of peace when he treked across the fields around his college campus. On fire were the photos of good times with friends and family, a vintage poster for the Sinnamahoning Rattlesnake Bagging competition, and the original watercolors – painted by Jim’s neighbor – of the cabin that used to sit on the site where his barn was built. When you walked into Jim’s barn, you walked into his mind, his past, his dreams, and his craft. Anyone who has lost something special through fire or theft or some other loss knows that when things are more than “stuff,” it is necessary to grieve them for the life-giving, memory-filled things they were. And so it is for Jim. 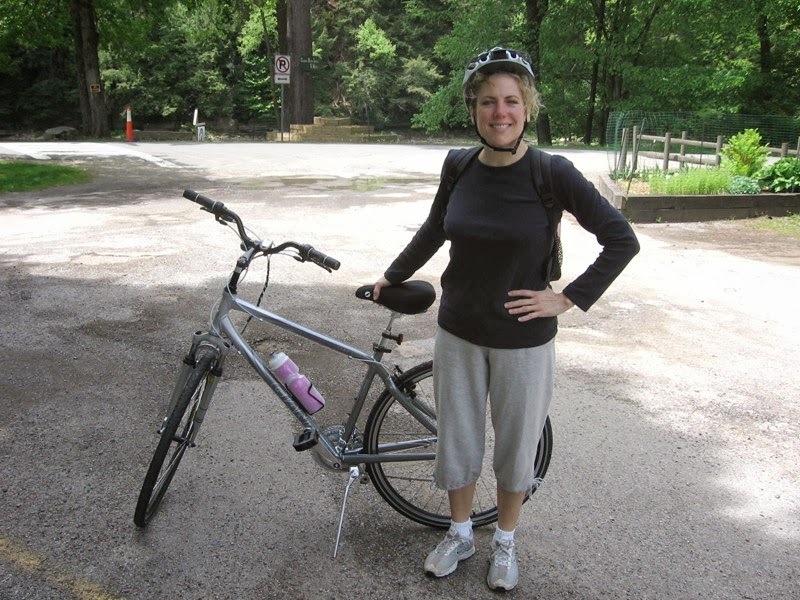 And for me, as I mourn the loss of my antique glider and whiskey barrel and, the most difficult, my bike. While no one was hurt, I hope and pray our barn kittens weren’t in the barn when the fire started. We haven’t seen them yet, but we’re clinging to the hope that they are hunkered down close by. So much to process. So much to do. This entry was posted in Grief, Love on February 4, 2014 by Lynn Haraldson. Oh, no! I'm so very sorry!! I can't imagine how scary that was. I'm glad no person was hurt but I'm sorry for all that was lost. Fire is such a beast. Very, very sorry this happened and very, very relieved you and Jim weren't physically hurt. My heart aches for you. This is so very,very hard. You have each other, so my prayer for you is that your lives are soon filled with wonderful new memories, along with items that attach those memories to you. Hugs Lynn. I'm so sorry. Thank you for blogging about this. It's a good reminder to me to photograph my sentimental items. Here's to feeling your feelings and taking the time to grieve as needed. Tough stuff. My heart is left heavy for you and your dear Jim. You so eloquently wrote, and thus brought to light how horrific this experience must be. (((Hugs))) to you as you struggle to find peace during this difficult time. I'm so sorry to hear this.. I've been readiing your blog for a while. Fire is terrible. While I'm glad you and Jim are okay physically, I was sad to read of your losses and am sorry that you all are going through this. I wish you both comfort; so glad you have each other to get through it! Thank you so much, everyone. Reality is sinking in, but I'm taking a cue from Jim, who is dealing with this with way more grace than I think I would have. There is talk of rebuilding…we will see. In the meantime, lots of insurance folks to deal with. Thank goodness he had that, though. Hope the kittens made it out! I hope you two are finding comfort together. It's hard to go through, but you are strong. What a tragedy, so very sorry about all that was lost for both you and Jim. I don't comment often, but just wanted to say how sorry I am for you both. I am So sorry. What a traumatic thing to witness. I hope your barn kitties turn up soon. How dreadful. Every once in a while I think of all we would lose with a house fire. Really scary. I 'hop' over to your blog from time to time. I certainly didn't expect to be reading this … so sorry to read about this, thoughts are with you. Oh no! How awful. I am sorry for the things you both lost. I really hope the kitties show up soon. I'm so sorry that this happened, Lynn. I'm so glad that you guys were safe, and I saw on Facebook that you found at least one of the kitties. So glad Jim had insurance too. So many people don't. I've been out of the “blogging loop” somewhat, due to surgery (my last post), but I want to say that I'm thinking of you both, although it's a bit later than I would have liked. I know how difficult this is. Take care, Lynn, and my best to you and Jim as you rebuild, savor old memories and make new ones. What a trauma, hope you are feeling okay. Good to hear plans of rebuilding but so sad for all that is lost. I'm a bit of a hoarder so can sympathise. Oh Mercy – I'm so glad that nobody was hurt, and very, very sorry for your loss. As you said, thank heavens for insurance.